Welcome to Round 8! 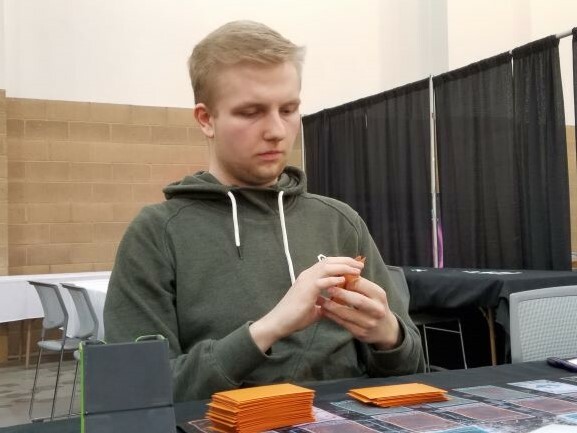 We haven’t really seen Thunder Dragons at the Feature Match table, so we picked Wolf Lechte, who brought his Thunder Dragons all the way from Germany! 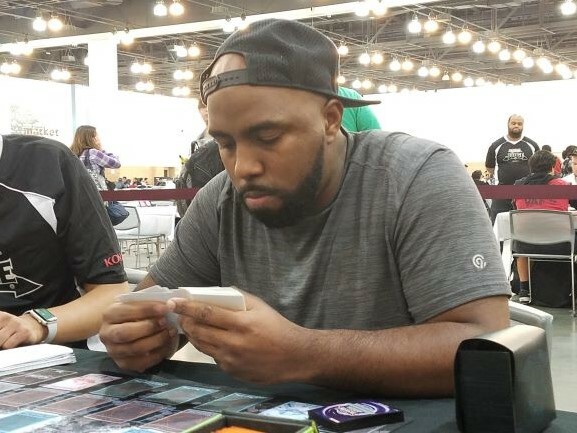 He’s against Los Angeles Duelist Richard Barnett, who we saw win his Round 6 Feature Match with his Gouki Deck. Barnett won the dice roll and played first. He led with Junk Forward, and activated Reasoning! Lechte guessed Level 3, but it was Destiny HERO – Malicious! Barnett used his two monsters to play Isolde, Two Tales of the Noble Knights, adding another Junk Forward to his hand. Isolde then sent Divine Sword – Phoenix Blade, Living Fossil, and D.D.R. – Different Dimension Reincarnation to the Graveyard to Special Summon Neo-Spacian Aqua Dolphin. It discarded Junk Forward, forcing Lechte to reveal his hand. Lechte thought a moment, and conceded already! Lechte had a hand of Thunder Dragonroar, Thunder Dragon, Brilliant Fusion, Thunder Dragonhawk, and Chaos Dragon Levianeer. 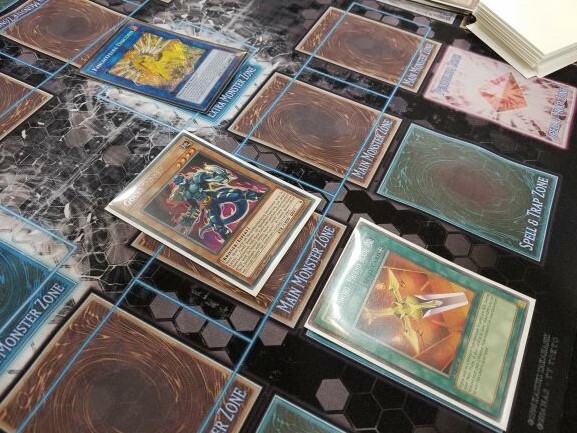 With Aqua Dolphin about to take away his Thunder Dragon, and Barnett showing no signs of ending his Link Summoning spree, Lechte opted to concede before Barnett could see what Deck Lechte was using. 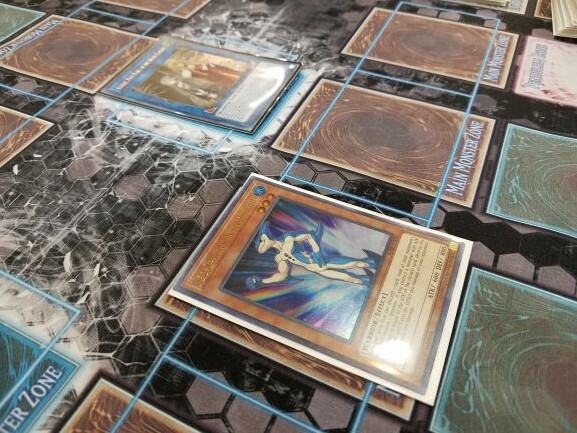 Hopefully that would give him an edge in Side Decking for the second Duel. Lechte began with a hand of Infinite Impermanence, Brilliant Fusion, Thunder Dragon, Ash Blossom & Joyous Spring, and Droll & Lock Bird. He Set Infinite Impermanence and passed. Barnett started with Junk Forward again, and Normal Summoned Gouki Twistcobra. He played Isolde, Two Tales of the Noble Knights, using the Isolde and Twistcobra effects to add another Twistcobra and Gouki Headbatt to his hand. Isolde then sent Divine Sword – Phoenix Blade to the Graveyard, and Lechte negated it with Ash Blossom. Barnett played Upstart Goblin. He activated The Phantom Knights of Shade Brigandine, using it with Isolde to play Summon Sorceress. He used its effect to Special Summon from his hand to Lechte’s field, and Lechte negated it with Infinite Impermanence. Summon Sorceress attacked directly. Lechte drew a second Brilliant Fusion. He activated it, fusing Gem-Knight Amber with Thunder Dragonroar, to play Gem-Knight Prismaura. He used Brilliant Fusion’s other effect to boost the ATK of Prismaura, discarding the Brilliant Fusion in his hand, and had Prismaura destroy Summon Sorceress in battle. Barnett played Gouki Suprex, which Special Summoned Twistcobra. He discarded Gouki Riscorpio to Special Summon Headbatt, boosting the ATK of Suprex. Then, he used Twistcobra’s effect to boost Suprex even further, and it added Gouki Re-Match to his hand. Lechte used Droll & Lock Bird now, stopping any further searches this turn. Barnett played Re-Match to bring Riscorpio and Twistcobra back to the field in Defense Position. He banished two Warriors to add Phoenix Blade to his hand. Riscorpio and Headbatt were used to play Knightmare Phoenix, which discarded Phoenix Blade to destroy both Brilliant Fusion and Prismaura. He took back Phoenix Blade again. He used his Knightmare Phoenix and Twistcobra to Link Summon Knightmare Unicorn. Finally, he equipped Suprex with Phoenix Blade to push it to a total of 4500 ATK! Unicorn and Suprex attacked directly, taking the Match! Richard Barnett wins his Feature Match yet again, with Gouki!